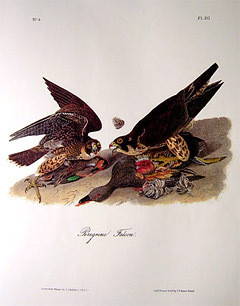 Pictured (right) is John J Audubon’s illustration of the Peregrine Falcon, today commonly referred to as the Peregrine Falcon. This hand-colored lithograph is Plate #20 from the Octavo Edition of Birds of America – created from 1840 to 1844. Look at these two pirates eating their dejeune a la fourchette, as it were, congratulating each other on the savouriness of the food in their grasp. One might think them epicures, but they are in fact gluttons. The male has obtained possession of a Green-winged Teal, while his mate has procured a Gadwal Duck. Their appetites are equal to their reckless daring, and they well deserve the name of “Pirates,” which I have above bestowed upon them. The Great-footed Hawk, or Peregrine Falcon, is now frequently to be met with in the United States, but within my remembrance it was a very scarce species in America. I can well recollect the time when, if I shot one or two individuals of the species in the course of a whole winter, I thought myself a fortunate mortal; whereas of late years I have shot two in one day, and perhaps a dozen in the course of a winter. It is quite impossible for me to account for this increase in their number, the more so that our plantations have equally increased, and we have now three gunners for every one that existed twenty years ago, and all of them ready to destroy a Hawk of any kind whenever an occasion presents itself. The flight of this bird is of astonishing rapidity. It is scarcely ever seen sailing, unless after being disappointed in its attempt to secure the prey which it has been pursuing, and even at such times it merely rises with a broad spiral circuit, to attain a sufficient elevation to enable it to reconnoitre a certain space below. It then emits a cry much resembling that of the Sparrrow Hawk, but greatly louder, like that of the European Kestrel, and flies off swiftly in quest of plunder. The search is often performed with a flight resembling that of the tame pigeon, until perceiving an object, it redoubles its flappings, and pursues the fugitive with a rapidity scarcely to be conceived. Its turnings, windings and cuttings through the air are now surprising. It follows and nears the timorous quarry at every turn and back-cutting which the latter attempts. Arrived within a few feet of the prey, the Falcon is seen protruding his powerful legs and talons to their full stretch. His wings are for a moment almost closed; the next instant he grapples the prize, which, if too weighty to be carried off directly, he forces obliquely towards the ground, sometimes a hundred yards from where it was seized, to kill it, and devour it on the spot. Should this happen over a large extent of water, the Falcon drops his prey, and sets off in quest of another. On the contrary, should it not prove too heavy, the exulting bird carries it off to a sequestered and secure place. He pursues the smaller Ducks, Water-hens, and other swimming birds, and if they are not quick in diving, seizes them, and rises with them from the water. I have seen this Hawk come at the report of a gun, and carry off a Teal not thirty steps distant from the sports-man who had killed it, with a daring assurance as surprising as unexpected. This conduct has been observed by many individuals, and is a characteristic trait of the species. The largest duck that I have seen this bird attack and grapple with on the wing is the Mallard. The Great-footed Hawk does not, however, content himself with water-fowl. He is sometimes seen following flocks of Pigeons and even Blackbirds. For several days I watched one of them that had taken a particular fancy to some tame pigeons, to secure which it went so far as to enter their house at one of the holes, seize a bird, and issue by another hole in an instant, causing such terror among the rest as to render me fearful that they would abandon the place. However, I fortunately shot the depredator. They occasionally feed on dead fish that have floated to the shores or sand bars. I saw several of them thus occupied while descending the Mississippi on a journey undertaken expressly for the purpose of observing and procuring different specimens of birds, and which lasted four months, as I followed the windings of that great river, floating down it only a few miles daily. During that period, I and my companion counted upwards of fifty of these Hawks, and killed several, among which was the female represented in the plate now before you, and which was found to contain in its stomach bones of birds, a few downy feathers, the gizzard of a Teal, and the eyes and many scales of a fish. It was shot on the 26th December, 1820. The ovary contained numerous eggs, two of which were as large as peas. Whilst in quest of food, the Great-footed Hawk will frequently alight on the highest dead branch of a tree in the immediate neighbourhood of such wet or marshy grounds as the Common Snipe resorts to by preference. His head is seen moving in short starts, as if he were counting every little space below; and while so engaged, the moment he spies a Snipe, down he darts like an arrow, making a rustling noise with his wings that may be heard several hundred yards off, seizes the Snipe, and flies away to some near wood to devour it. It is a cleanly bird, in respect to feeding. No sooner is the prey dead than the Falcon turns its belly upward, and begins to pluck it with his bill, which he does very expertly, holding it meantime quite fast in his talons; and as soon as a portion is cleared of feathers, tears the flesh in large pieces, and swallows it with great avidity. If it is a large bird, he leaves the refuse parts, but, if small, swallows the whole in pieces. Should he be approached by an enemy, he rises with it and flies off into the interior of the woods, or if he happens to be in a meadow, to some considerable distance, he being more wary at such times than when he has alighted on a tree. The Great-footed Hawk is a heavy, compact, and firmly built bird for its size, and when arrived at maturity, extremely muscular, with very tough flesh. The plumage differs greatly according to age. I have seen it vary in different individuals, from the deepest chocolate-brown to light grey. Their grasp is so firm, that should one be hit while perched, and not shot quite dead, it will cling to the branch until life has departed. Like most other Hawks, this is a solitary bird, except during the breeding season, at the beginning of which it is seen in pairs. Their season of breeding is so very early, that it might be said to be in winter. I have seen the male caressing the female as early as the first days of December. This species visits Louisiana during the winter months only; for although I have observed it mating then, it generally disappears a few days after, and in a fortnight later none can be seen. It is scarce in the Middle States, where, as well as in the Southern Districts, it lives along water-courses, and in the neighbourhood of the shores of the sea and inland lakes. I should think that they breed in the United States, having shot a pair in the month of August near the Falls of Niagara. It is extremely tenacious of life, and if not wounded in the wings, though mortally so in the body, it flies to the last gasp, and does not fall until life is extinct. I never saw one of them attack a quadruped, although I have frequently seen them perched within sight of squirrels, which I thought they might easily have secured, had they been so inclined. Once when nearing the coast of England, being then about a hundred and fifty miles distant from it, in the month of July, I obtained a pair of these birds, which had come on board our vessel, and had been shot there. I examined them with care, and found no difference between them and those which I had shot in America. They are at present scarce in England, where I have seen only a few. In London, some individuals of the species resort to the cupola of St. Paul’s Cathedral, and the towers of Westminster Abbey, to roost, and probably to breed. I have seen them depart from these places at day dawn, and return in the evening. The achievements of this species are well known in Europe, where it is even at the present day trained for the chase. Whilst on a visit at Dalmahoy, the seat of the Earl of Morton, near Edinburgh, I had the pleasure of seeing a pair of these birds hooded, and with small brass bells on their legs, in excellent training. They were the property of that nobleman. These birds sometimes roost in the hollows of trees. I saw one resorting for weeks every night to a hole in a dead sycamore, near Louisville, in Kentucky. It generally came to the place a little before sunset, alighted on the dead branches, and in a short time after flew into the hollow, where it spent the night, and from whence I saw it issuing at dawn. I have known them also retire for the same purpose to the crevices of high cliffs, on the banks of Green river in the same state. One winter, when I had occasion to cross the Homochitta river, in the State of Mississippi, I observed these Hawks in greater numbers than I had ever before seen. Many persons believe that this Hawk, and some others, never drink any other fluid than the blood of their victims; but this is an error. I have seen them alight on sand-bars, walk to the edge of them, immerse their bills nearly up to the eyes in the water, and drink in a continued manner, as Pigeons are known to do. GREAT-FOOTED HAWK, Wils. Amer. Orn., vol. ix. p. 120. FALCO PEREGRINUS, Bonap. Syn., p. 27. COMMON or WANDERING FALCON, Falco peregrinus, Nutt. Man., vol. i. p. 53. GREAT-FOOTED HAWK, Falco peregrinus, Aud. Amer. OrD., VOI. i. p. 85; vol. v. p. 365. FALCO PEREGRINUS, Peregrine Falcon, Swains. & Rich. F. Bor. Amer., vol. ii. p. 23. Bill blackish-blue at the tip, pale green at the base, cere oil-green; bare orbital space orange. Iris hazel. Feet lemon-yellow; claws brownish-black. Head and hind neck greyish-black, tinged with blue; the rest of the upper parts dark bluish-grey, indistinctly barred with deep brown. Quills blackish-brown, the inner webs marked with transverse elliptical spots of reddish-white. Tail greyish-brown, marked with about twelve bars, the last of which is broad, the rest diminishing in size and intensity of tint. Throat and fore-neck white; a broad band of blackish-blue from the angle of the mouth downwards; cheeks whitish-grey; sides, breast and thighs reddish-white, transversely marked with dark brown spots in longitudinal series. Under wing feathers whitish, transversely barred. Length 16 1/2 inches; extent of wings 30; bill 1 1/8 along the ridge; tarsus 1 7/8, middle toe 2 1/2.